Many Ryus,schools, systems within some family clans where founded. Das Daito Ryu (one may call the base of Kokodo and all the other Aikido and Aiki Ju Jutsu stiles) was the school of the long time most successful families in feudal Japan. In the 19th century his school was transferred to the very gifted swordsman Takeda Sokaku who was at that time also the bodyguard of the head of Daito Ryu Minamoto Yoshimitsu weitergegeben, who altered and improved the system, opened a dojo and thaught Daito Ryu Aiki Ju Jutsu. Two of his pupils where Morihei Ueshiba, the founder of Aikido and Ryuho Okuyama the founder of Hakko Ryu. Meridiantheraphy and Shiatsu (Finger pressure treatment) and added it to his fighting art. at teh age of 40 he left Daito Ryu and founded his own school of Hakko Ryu. Kokodo Ju Jutsu has been founded by Irie Yasuhiro after he left Hakko Ryu Hombu Dojo 1993 as a Shihan in the highest rank (Menkyo Kaiden San Dai Kichu) . He started his own style of Jiu Jitsu by embedding the Aiki principle (to face the attacker’s power with a suitable force by adapting to the attack not counter against it). His aim was to create with the help of a traditional martial art a modern and contemporary Budo system. 1990 Soke Irie opdened his Kokodo Klinik for Shiatsu and accupuncture. 1995 started his own Dojo in the style of Kokodo Ju Jutsu and is so the first (Shodai) Soke (founder) of Kokodo Jiu Jitsu. 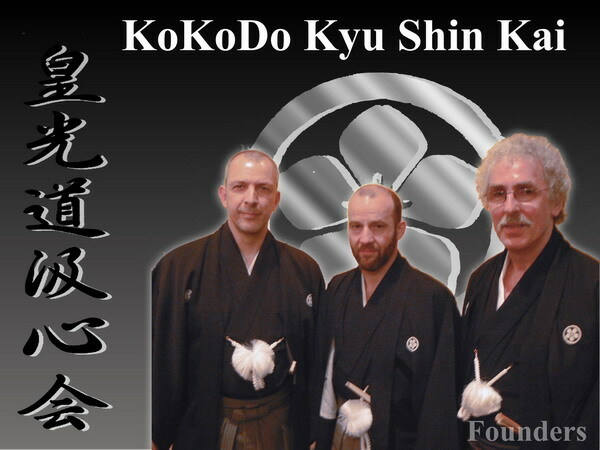 Kokodo Kyu Shin Kai (the school of understanding the heart of KokoDo)is a worldwide organization by Kokodo Dojos. It was founded by three Shihans that wanted to go the same way to combine values like friendship,respect and harmony with the way of the traditional Ju Jutsu. It was founded at march 30th 2005 to teach and spread the art of KokoDo in the style of Soke Irie. To reach that goal they train on regular basis at the Hombu Dojo in Japan, do seminars (Tai Kais) and occasionally also hold trainings all over the world. The founders are (fromright to left) Kaiden Shihan Etienne Beynaerts, Menkyo Kaiden Shihan Ivo Belmans and Kaiden Shihan Erik Melotte.